Established in 1999 by the Greater Atlanta Home Builders Association and Southface, EarthCraft is a green building certification program that serves Georgia, Virginia, Tennessee, Alabama, South Carolina and North Carolina. By addressing the factors that impact homes in this region, including high heat, humidity and temperature swings. 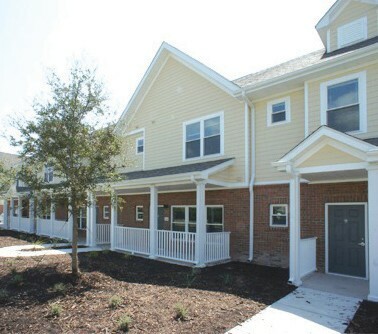 The townhome apartments are the first project in the fast growing community of Pooler, GA (Outside Savannah, GA) to achieve any LEED certification. Trident Sustainability Group served as the LEED consultant for the project. The 50 unit affordable housing project provides a showcase in sustainability. A community wide geothermal heating and cooling system combined with efficient lighting and insulation provides extremely low utility bills. Water-efficient plumbing fixtures cut water use 40%, and low-VOC paints and finishes help occupants enjoy high indoor air quality. All stormwater is managed on site, and tree preservation and native landscaping surround the project, while a large community garden gives residents an opportunity to grow their own food.